In recent decades, vehicles running on diesel engines always held an advantage over their gasoline engine counterparts in a number of aspects. But with all the technological advancements in engine performance, gasoline-powered cars have caught up by now, haven’t they? Let’s find out by establishing the most basic differences between the two. A diesel engine works by the ignition of diesel fuel injected into a combustion chamber. It is an internal combustion engine where a spark is not required to ignite the fuel; instead, air subjected to tremendous pressure becomes superheated and ignites the injected, atomized diesel fuel. The diesel engine is also called a compression-ignition engine. Diesel engines do not use spark plugs to burn fuel, which means no ignition tune-ups are needed. This distinct feature also contributes to the diesel engine’s fuel efficiency. However, diesel engines do require regular maintenance. Diesel-powered cars are usually expensive, not to mention the higher price of diesel fuel at the pump. Diesel engines are capable of producing a greater amount torque, which is why larger trucks run on them. While fuel efficiency is dependent on several factors (e.g., drag, engine parameters), passenger cars using diesel engines are 30% fuel efficient. Although newer diesel engines have been improved for cleaner emissions, they still produce harmful by-products such as soot, carcinogens, and nitrous oxide. Burning a gallon of diesel can produce nearly 23 pounds of carbon dioxide. About 440 million metric pounds of carbon dioxide emissions from diesel-powered vehicles were recorded in the US in 2015. Gas-powered vehicles are internal combustion engines that run on gasoline fuel. This gasoline fuel mixes with the air before getting inducted into the cylinder during intake. 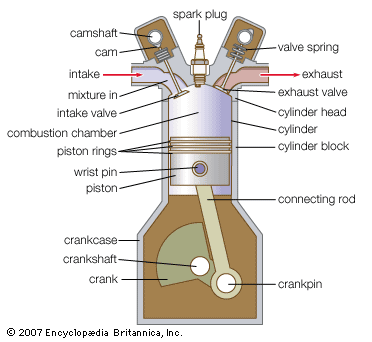 The piston compresses the mixture of fuel and air is ignited by a spark plug, creating combustion. Most cars in the US make use of gas engines. Passenger cars powered by gas engines are usually 20% fuel efficient and less expensive to maintain. A gas engine is typically lightweight and runs a maximum of 4,000 hours in its lifetime. There are less vibrations and noise as well. A car burning a gallon of gasoline can produce about 19.64 pounds of carbon dioxide. In 2015, nearly 1,105 million metric pounds of carbon dioxide emissions were produced by gas-powered engines. The quality of gasoline fuel is measured by its ability to resist knocking and is determined by its octane rating. Gasoline is offered in various levels of octane ratings. Gas engines are made up of lighter components, thus they have better power-to-weight ratio and acceleration. So, what’s the difference between diesel and gas engines? Diesel-powered engines do not need a spark to ignite the fuel to start the combustion process, and ultimately get the engine to start running. 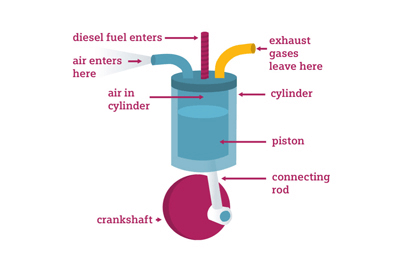 Gas engines start the combustion process with a spark coming from a spark plug, whereas a diesel engine uses highly pressurized air to ignite the fuel. In addition, diesel engine parts are built stronger compared to gas engine parts. Diesel engines produce more torque, but do not have the power and acceleration of gas-powered engines. For this reason, trucks and larger vehicles rely on diesel engines for climbing hills or carrying heavy loads. Moreover, gas engines are now turbocharged and made lighter to become more fuel efficient.